The proteome is the entire complement of proteins expressed by a genome, cell, tissue or organism. More specifically, it is the expressed proteins at a given time point under defined conditions. The term is a blend of proteins and genome. 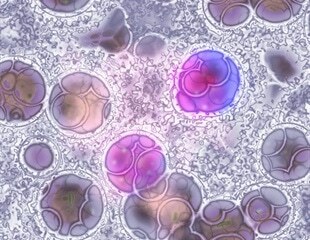 Only about one in four people diagnosed with acute myelogenous leukemia (AML) survive five years after the initial diagnosis. Autophagy - the process of recycling cellular material in the body, can help combat Salmonella and other pathogens according to researchers at the School of Life Sciences, University of Warwick who have studied how autophagy can get rid of bacteria, and prevent diseases developing. Scientists at the University of Illinois at Chicago have developed a way to identify the beginning of every gene -- known as a translation start site or a start codon -- in bacterial cell DNA with a single experiment and, through this method, they have shown that an individual gene is capable of coding for more than one protein. One in four people in Western and Asian societies develop a build-up of fat in the liver as a result of an unhealthy diet. This disease - referred to as non-alcoholic fatty liver disease (NAFLD) - causes no symptoms initially but can develop into end-stage liver cirrhosis with limited treatment options. Cholesterol carried in high-density lipoprotein particles, or HDL cholesterol, has been dubbed the good cholesterol, because people whose HDL levels are high have a lower risk of developing heart disease. That link was first established in 1977 and has been confirmed over and over in epidemiological studies. Routine sequencing has given unprecedented insight into the genetics of rare diseases, but genomics fails to diagnose up to half of patients who are tested. That's the problem German scientists tackled in a recent study in the journal Molecular & Cellular Proteomics. Syrian hamsters are golden-haired rodents often kept as house pets. Cold and darkness can cause the animals to hibernate for 3-4 days at a time, interspersed with short periods of activity. Gero is a data-driven longevity company developing innovative therapies that will strongly extend the healthy period of life also known as healthspan. Latest results of Gero aging studies will be presented at Longevity Therapeutics Conference in San Francisco, January 29-31, 2019. Severe burns can leave physical and psychological scars, especially in children. When a burn patient enters the clinic, doctors use factors such as the depth and size of the burn, as well as the time required for skin healing--or re-epithelialization--to determine the best course of treatment. In response to current regulatory guidance a Mass Spectrometry-based Host Cell Protein detection approach with faster, more accurate and wider-ranging detection is essential. Researchers at Karolinska Institutet and SciLifeLab have developed a new method of analysis that maps the location of proteins in the cell. The information has been compiled in a database that is accessible to researchers around the world. Researchers at the University of Eastern Finland have discovered new changes occurring in the human brain in the early stages of Alzheimer's disease. Scientists at McMaster University have discovered several new biomarkers from a single drop of blood that could allow earlier and more definitive detection of cystic fibrosis, a genetic disease which strikes both children and adults, causing chronic problems with the digestive system and the lungs. The new version of InSyBio Suite has a significant increase in speed and refinement of the predictive biomarkers process. The NorLux Neuro-Oncology Laboratory at LIH's Department of Oncology conducts research on brain diseases, with a special emphasis on glioma biology, drug resistance and systems approaches. In a study of proteins historic in its scope, researchers at Oregon State University have pushed closer both to a vaccine for gonorrhea and toward understanding why the bacteria that cause the disease are so good at fending off antimicrobial drugs. Affecting around 2 % of the population, autoimmune rheumatic diseases can have severe symptoms, including painful and swollen joints, fever, rashes, fatigue and sensitivity to the sun, with patients needing regular check-ups.